Smartphone users have an amazing passion for their platform of choice. This makes for strong opinions about the Xero mobile experience. Our Android customers are especially particular! Witness how low they rated the app in the pre-native era. One of the more consistent pieces of feedback we’ve had recently is that the app “looks old.” Although it was only released about a year and a half ago, things move fast in the mobile world. To see just how fast, take a look at this great illustrated history of Android from The Verge. Today, 60 percent of Xero Android users are already on the latest OS version, Lollipop. This release brings the last remaining elements of receipts to the Android platform. Receipt entry is now optimized for single line items — the most common type. We’ve also tucked “sometimes” fields into the overflow menu. You’ll only be presented with the fields you always need to fill out. The other significant usability update is to invoicing. Here you’ll find a much simpler and less cluttered interface. Again, we’ve focused first on the things you need most. 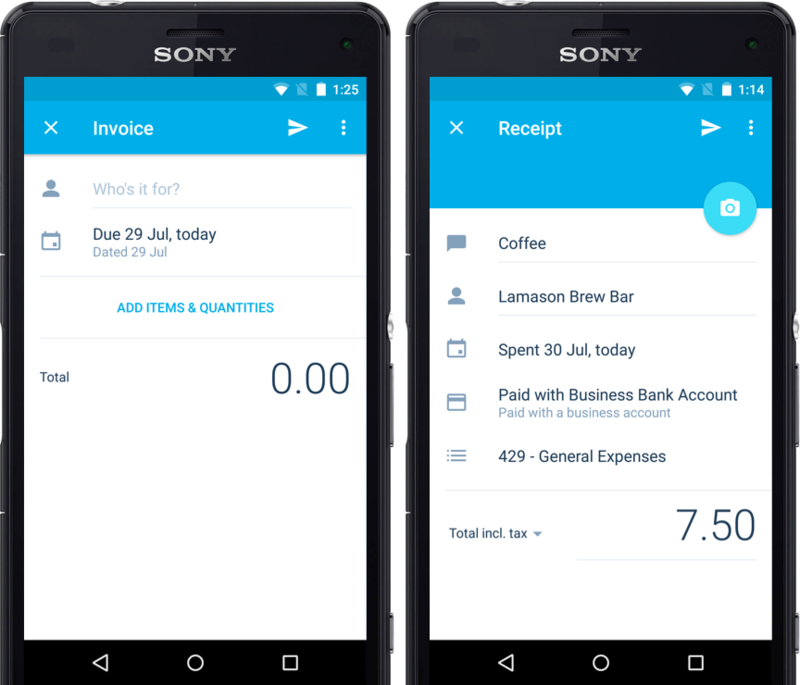 Receipts comes to Android! Easier, faster, simpler mobile invoicing. As mentioned above, 60 percent of our Xero Android users are running Lollipop. Android is usually thought of as a fragmented ecosystem. This is still partly true. Xero customers use 1,154 different Android handsets! Google’s effort to standardize on more recent flavours of the OS is working, though. 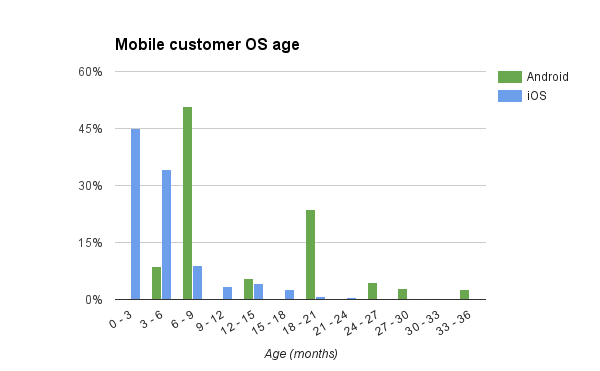 The big spike at the 18- to 21-month-old mark is from older Samsung phones (like the Galaxy S4 and the Note 3). It seems unfair to ding Google for this. In fact, looking only at flagship devices, Android just squeaks past iOS on this measure. Android phones are running an OS that is (on average) 126 days old, compared to 127 days for iPhones. We hope you’ll be pleased to hear that the next Android updates will include the ability to add contacts and to mark invoices as paid. If you haven’t checked in with the app for a while, we’d encourage you to give it a try. We welcome your feedback on what we’ve done with the app — good or bad. If you’ve got a minute or two, please consider rating the Xero Android app on Google Play. We read all your reviews and, along with feature requests in Xero Community, they help us decide what to focus on next.